The Scottish Highlands and Islands area is one of the most scenic in Nothern Europe, and includes the mountainous areas of North and West Scotland, covering Stirling, Perth and Kinross and Aberdeen, as well as the Islands of Orkney, Shetland and the Inner and Outer Hebrides. The Highlands area is distinct from the Scottish Lowlands, having preserved Gaelic speech and customs long after the anglicisation of the Lowlands. The City of Inverness is often regarded as the Capital of the Highlands. Glasgow is the ideal base for a visit to the Highlands and Islands because of its central location, and good air, rail and bus links to other parts of the UK and abroad. Regular public transport services connect Glasgow to most towns in the Highlands - for example, a train from Glasgow Queen Street to Inverness takes approximately 3 hours. 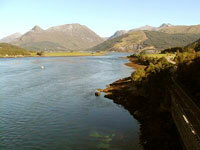 The Sandyford Hotel offers information about travel from Glasgow to the Highlands and Islands. For more information about what's on in Scotland during your visit, get in touch by phone or email.